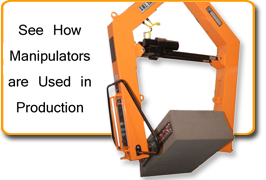 Mold Manipulators Explosion Proof - Quiptec Inc. Battery - PoweredIdeal solution when the manipulator needs to be moved freely or when a direct connection to plant power is not possible. 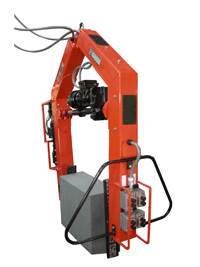 Explosion ProofSpecial power-rollover mold manipulator designed for use in a Class 1 Division 1 environment. Standard ModelsA complete list of our standard models including dimensions and mold carrying capacities. Special power-rollover mold manipulator designed for use in a Class 1, Division 1 environment. Actuator motor and rotate-drive motors are rated explosion-proof. Normal push-button panel replaced with an electrical enclosure which meets Class 1, Division 1 standards. All electrical components are mounted in a pedestal outside of the working area, with appropriate cable connections to the mold manipulator.